The process of sending money from one county to another is called foreign remittance. Generally money is transferred to foreign by various ways like bill of exchange, bank draft, travellers cheque or letter of credit etc. All these techniques of sending money from one country to another is called foreign remittance. 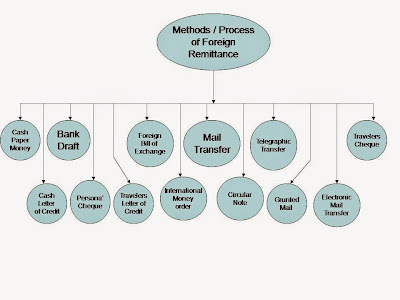 Methods /Process/Techniques of Remittances . In this system bank orders to its foreign branches or agents to give an equivalent amount of foreign currency to a particular individual. Here bank receives country's money for bank draft and Calculates it to foreign currency with commission & vat. The most using medium of sending money to foreign is foreign bill of exchange. Payee or creditor makes and sends it to debtor for approval. If debtor approves then it is considered as legal document. Payee can en-cash such bill from particular bank of his country. In this system debtor pay in or deposits a particular amount of money with commission & vat to bank for money transferred. Bank sends an order of payment the necessary particular money with receivers name & address through postage or mail to its agent or foreign branch. After sending the information of that money has already been sent by the sender & bank to payee in time then he can withdraw it. In this system money is transferred very fast by bank to the foreign. Sender pays in money with determined commission to bank. Bank sends an order very fast to its foreign branch or agent with telephone for giving a determined amount of money to a particular individual with name and address. After then that individual collects money from that branch or agent. This is also a medium of sending money by bank. Cumulating the amount of money with commission & fees bank issues one or more than one cheque in the name of traveller. Through this cheque bank gives an order to its foreign branch or agent for paying the amount mentioned into cheque to the traveller. Paying specific amount of cash the importer orders to bank to issue a letter of credit in favour of exporter or creditor. Submitting that letter of credit to a particular bank, the exporter can collect the cash. In his method debtor sends a cheque of his own account to creditor. Creditor can collects that money placing that cheque to any branch of orderer bank. In this method a money order contract among various countries is made and placing money with specific duty & vat to post office currency is sent to the foreign countries. It's a modern edition or version to send money through postage. In this system the sender places money to post office and that post office sends a order letter to the post office of creditors county. At last the payee can collect that money before or after reached that guaranteed mail to his hand. In this system money is sent to foreign countries through bank and renowned financial institutions. Sender pays or places money to bank and bank provides him a secret pin code. Sender apprises that code to payee and bank informs and orders to its agent & foreign branches through e-mail about receiver with all information to pay that money. Giving or placing that secured number to that agent or determined bank the paternal can collect that money. Currency may be sent to foreign With the help of cash paper money. Generally such opportunity is given at a special emergency condition. This system is effect able if good relation and cash payment is continued between the two countries. It is a letter of credit which a bank issues travellers for the convenience of the person who want to travel with in the country or abroad. Bank gives an order to its foreign branch or agent to pay specific amount of money through circular note. Payee can collect money giving signature on the delivery or submission letter attached with the circular note. At last it is said that ATM card, On-line banking, SWIFT etc. are used in modern banking system to send money to the foreign countries except the above discussed system or methods. And in future the banks will find out the most easy & fast system to send money or currencies from one county to another. When I read it I realize that I just want this topic and so I’m wondered that it’s here. These all the tips regarding “Foreign Remittance” method are unexplained and paper writer service offer me useful task. So thanks a lot Mr. Nazmul Haque for presenting this article.